One of the cool things about amassing a zillion frequent flyer miles is actually using them to fly in first class to destinations you previously never thought you’d visit. 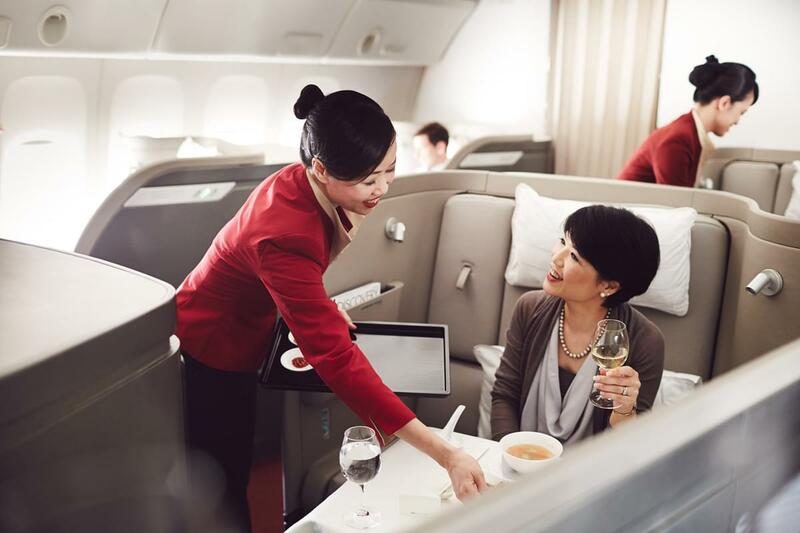 Asia is especially enticing when you have frequent flyer miles because you can finally make that long-haul trip in the comfort of the first class cabin. Maybe you’ll jet off to Tokyo, Hong Kong, Shanghai, Seoul or Singapore. If you’ve got Asia aspirations, we’ll tell you what to look for and how to plan it to ensure a happy and romantic trip. Warning: The issue we’re about to discuss is definitely one of those first world problems. 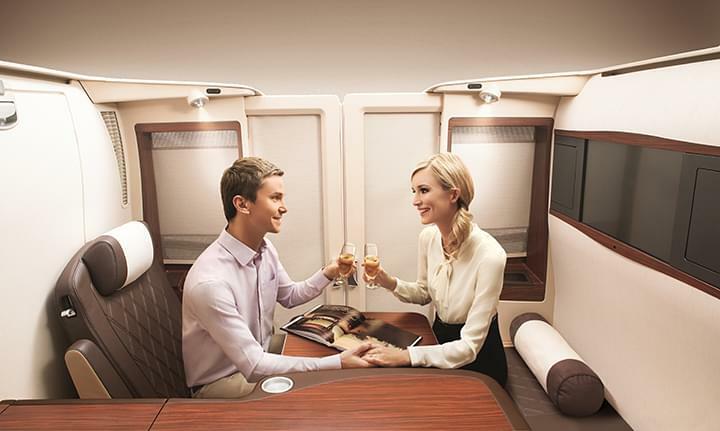 Choosing which first class flight to Asia isn’t really a chore as much as it’s a privilege. Yet, couples often end up making choices that aren’t quite in keeping with what they were hoping for: a romantic flight in a posh first class cabin. Sometimes they get the posh, but the seating layout means they are actually so far away from each other that they can’t talk during the flight or even see each other without standing up or leaning far over their own seat. That’s why it pays to carefully review the aircraft used on the flight to make sure it fulfills your desire to be pampered in first class while also allowing a pair to travel together without feeling disjointed for 10 or more hours inflight. If you’re traveling with someone you actually want to spend time with, it’s important to consider the things that will make a long flight exciting or enjoyable. Flying first class is your chance to indulge in expensive niceties like Champagne by Krug, caviar, and other haute menu options like lobster and prime beef. It’s also really fun to change into the pajamas the airline has gifted you so you can lounge as if it’s your own private aircraft. flight duration—Some people actually love flying so a longer flight or connections on two equally nice aircraft are options. aircraft layout—If you’re traveling on something like an Airbus A380, there will be an upstairs and downstairs. If you’ve got a preference for one lever over another, consider that before booking. seating configuration—Look at the seating chart to see how first class is configured and if you’ll be able to easily chat and enjoy meals or if you’ll both be in your own separate cocoons. meal service—First class is usually a treat but can be an elevated experience in the gourmet department when you travel on one of the Asian airlines, Lufthansa, or Swiss. If fancy meals, Champagne, and wine are important to you, consult the airline’s website in advance of booking to be sure their approach to food and wine matches your expectations. amenities—Who doesn’t love getting a beautiful bag of designer skincare products? Most first-class cabins gift each passenger with a bag of necessities, from a toothbrush and toothpaste to skin moisturizer to earplugs and an eye mask. Some airlines also provide pajamas so you can be more comfortable inflight. service—Finally, some airlines are just better when it comes to the personal touch. If service is important to you above all else, read online reviews of the airlines you’re considering and then make your selection based on who is best in class. In-flight Meals: Chef-made Korean and Western options are available. Korean dishes include things like braised short ribs and spicy rock fish soup Western entrees tempt with things like poached lobster or tenderloin steak with green peppercorn sauce. Caviar is available too. First-class passengers may pre-order their meals prior to the flight if they wish. Amenities: You’ll receive comfortable knit pajamas, slippers, and a Samsonite amenity kit that includes things like moisturizing lotion, toothbrush and toothpaste, eye mask, and earplugs. In-flight Meals: There are two full menus: one consisting of Western-style dishes and the other one devoted to the food of Japan. Enjoy an “anytime” menu of amazing ramen soups; curry dishes; stir fries; and even a cheese course with Chaource, Roquefort, Pont-l’Eveque, and Saint-Maure de Touraine. For dinner, try something like deep-fried scallops with grated daikon radish sauce and at breakfast opt for the porcini omelet with veal sausage. On the beverage front, expect Champagne from Krug and Henri Giraud as well as a large selection of red and white wines as well as sake (fermented rice) and shochu (distilled rice, barely, and sweet potato). Unique Touches: Each suite pod has its own “do not disturb” system. Just switch the light on when you don’t want to be disturbed and the stewardesses will respect your wishes. The cabin is aesthetically interesting since all of the suite pods are square-ish. It’s a very boxy cabin and not the design style you might expect from an Asian airline. Amenities: Amenity kits are by Aesop and have the necessities. The airline no longer offers Shanghai Tang pajamas but the lounging outfit you do receive is still quite nice. In-flight Meals: Most people start off their meal with some caviar and Champagne. Then, opt for a salad or soup before your entrée. If you’re flying from a U.S. gateway, you’ll likely be offered some type of USDA prime beef. Chinese meals are also offered. The stir-fried lobster with steamed jasmine rice is delicious. And don’t miss some of the signature drinks like the nonalcoholic Oriental Breeze, which is sour plum tea, cranberry juice, honey, lemon, and rose water. Quite refreshing! Unique Touches: Each first-class suite has a guest chair and a large enough dining table for two. Amenities: Look forward to an amenity kit by Ferragamo. In-flight Meals: The airline is known for its Book the Cook service, where you order your main course up to 24 hours before you fly. The meals are designed by name chefs and include things like filet of veal in Pommery mustard sauce, artichoke-tomato crusted loin of lamb, or suckling pig with a dark beer sauce. Unique Touches: Singapore Suites feature both a seat and a separate bed and meals are served on swanky Wedgwood china. This is one of the ultimate frequent flyer experiences. If you can, book it!